The 51th annual B. F. Goodrich SCORE Baja 1000 will run on Nov. 14th-18th, 2018. Traditionally, the course alternates between an Ensenada finish and a La Paz finish, this year the race course will run only the northern state of the peninsula, beginning in Ensenada, Baja California and ending in r.there as well. Events begin on Tuesday, November 14th, with the availability of satellite monitoring equipment and first-come chassis inspections. Wednesday is more of the same in Ensenada, Tech inspections and walk in registration until 4PM. Press briefing 11:30AM The mandatory 4 wheel entry driver meeting and 7PM. Staging for motos and quads begins at 11PM. Friday, Finish line tent for SCORE and La Paz Sec of Tourism at finish line, Location TBD. Unofficial race resulkts to be posted as they arrive. The actual race will kick off in Ensenada along the Blvd. Lázaro Cárdenas at 12AM Thursday with the motorcycle/ATV classes leading off and a new rider will start every 30 seconds. There is a break before the the bigger vehicles classes begin starts at 10:30AM. The Baja 1000 began in 1967 with many changes over the years but it has always been considered the mother of all desert races. Celebrities in the past like actors James Garner, Steve McQueen and Paul Newman. The race has its own celebrities like Rod Hall, Johnny Campbell (11 wins), Larry Roesseler (17 class wins,13 overall wins) Ron Bishop, Robby Gordon ( NASCAR racer) and Johnny Johnson (retired with 15 class wins). Rod Hall is the only person that has run in all 45 previous races and at age 74 has 22 class wins including one overall win in 1972. This is just a few of the celebrities that have raced in the past with some continuing to race in this year’s Baja 1000. The Baja 1000 has been the granddaddy of all desert races for years and with the growing popularity it is now a part of the World Championship of Desert racing which will include 2 of 3 SCORE Baja Desert Series races and 3 of the 4 HDRA 2013 races held in the U.S. There are many more awards such as the SCORE Off-Roadsmen of the Year, Toyota Milestone who complete every mile of the entire race season. 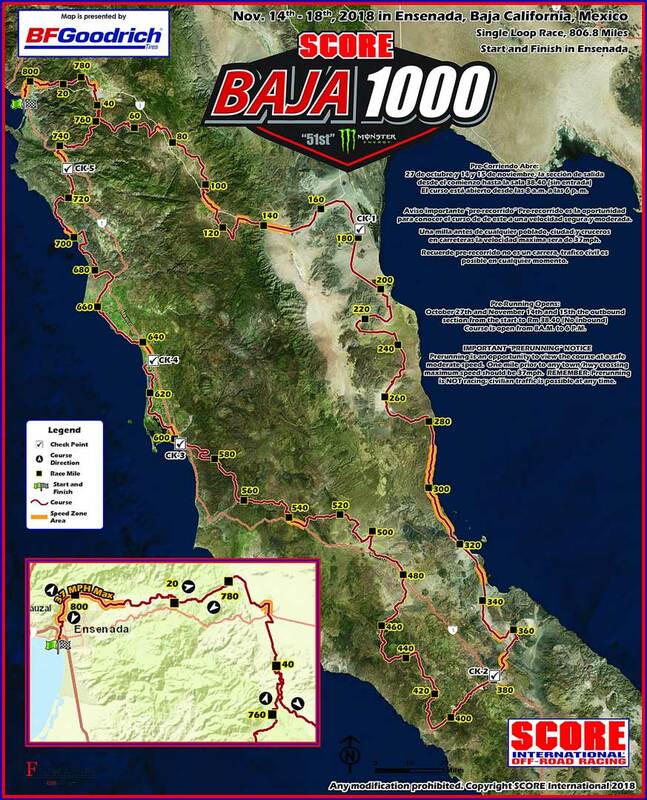 To watch the start or the finish of the Baja 1000 in person is truly something to see and there will be live tracking and coverage of the race this year. Many people come out to camp all night out along the race course at specific turns where the action is. Whether you can do that or not you can always follow the race action via the web. For more information on the coverage and tracking or just to see more details of the race go to www.score-international.com.